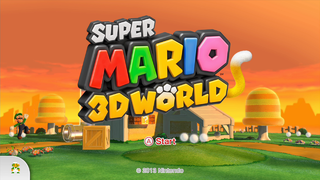 Super Mario 3D World continues the brand new tradition of tacking "3D" on to the title of a completely unrelated Mario title. Located in /SystemData/MemorySystem.szs is a file named HeapSizeDefine.byml that defines heap sizes for levels. However, this does not apply to every single level, as there are 40 unused test stage strings located in this file. Many of the level names have staff names in them. TestIwasaYokoScroll01Stage - "Yoko" means horizontal, so "YokoScroll" might refer to 2D or auto-scroll sections. TestShiraiUraJumpFlip - "Ura" can mean "Another" and "JumpFlip" refers to the Flip-Swap platforms. TestMusaShisakuDaysStage00 - It is unknown what "ShisakuDays" refers to. TestMiyamaStartEvent - "StartEvent"s are camera movements or sound effects that are played at the begining of a level, e.g. the camera intro in World 1-1 - Super Bell Hill. TestIwasaArrangeBossParade02Stage - "ArrangeBossParade" is World Flower-12 - Boss Blitz. TestMCLPlayerStage - "MCL" might stand for Mox Co., Ltd., one of the companies listed in the staff roll. The executable file, RedCarpet.rpx, also refers to a removed stage. The string exists beside the internal names of some used levels. This track's internal name is STM_BGM_TEST_BEATSYNC, suggesting it was for testing involving Beat Blocks. It's not referring to the "House" style of music, and it's likely not referring to the Super Mario Bros. 3 Toad Houses, as those were referred to as "KINOHOUSE" in the previous game. The "02" in the filename suggests the stream was revised or had an alternate version(s) at some point. A standalone version of the World 2 theme. The game uses the copy stored in the second track of STM_RC_BGM_MAP01.bfstm. In the USA kiosk demo, it is no longer present. A copy of the Super Star theme can be found in the music folder, which was presumably used as a test track. Super Mario 3D Land also has a duplicate copy of its Super Star theme. On recent versions of the Wii U system software, the Wii U Menu banner jingle only plays for about 8 seconds before the game starts automatically. You can hear the whole thing by removing the disc while the banner is displayed. The full track can also be heard on the soundtrack CD. An icon for an orange-colored Mario and a corresponding orange S logo, stored with the player icons. Their purpose is unknown, but it could be related to the "Assist Block", a feature in Donkey Kong Country Returns that activates the Super Guide and features the Super Guide Kong. A hand icon, also stored with the player icons. Presumably, this was intended for a fifth player to control the "hand" (the one that can collect coins, hold enemies, etc.) separately with the GamePad, similar to New Super Mario Bros. U.
Super Mario 3D World's executable is internally referenced as RedCarpet. There is no other context to explain the rather... obscure project name, other than the prior game having an internal name of RedPepper. Other files in the game do refer to the project name, primarily abbreviated. The internal name is also reflected in the game's two-letter code "RD". The castle music files are called *Castle01*, but there are no 00s or 02s. This page was last modified on 1 August 2018, at 21:38.